GS Polyflex or Polygon hose is fully interlocked hose furnished without packing. Its most important feature is its polygon shape (typically 16 to 20 sides) instead of smooth construction. This helps it to maintain the dimensions closely. It offers (limited) pressure tightness without the need of any packing. Thereby its serviceable temperature is as high as 600 C. At the same time fully interlocked construction imparts great crush resistance and high tensile strength. Size Range	:N.B.1-1/2" to 8"
Any type of standard or specialized fittings can be adapted to suit this hose. The fittings can be attached by welding, brazing or using epoxy adhesives. The GS UltraFlex is manufactured in Galvanized Steel and Stainless Steel as a standard. The Polygon Hose has moderate flexibility, (limited) pressure tightness, excellent crush resistance and good tensile strength. Thus it is ideally suited for discharge of Exhaust and high temperature gases at atmospheric pressure. It is very durable in chemically corrosive environments. Maintenance of close dimension makes it useful as ideal protective casing. 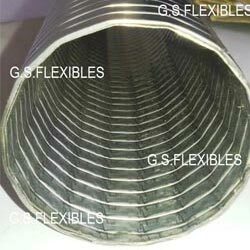 It used for the protection of non-metallic hoses and as additional armour to corrugated hose.